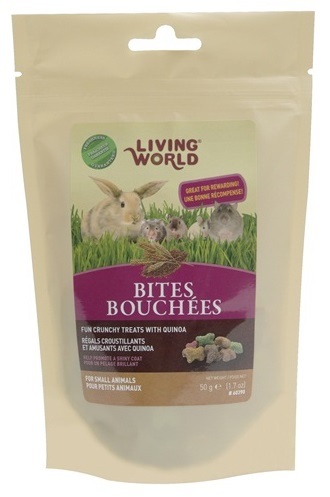 Living World Quinoa Bites are crunchy treats with great a Quinoa flavor, great for training and rewarding your small Critter. Hiding them around their habitat will stimulate their natural instinct to forage and nibble. Only the finest ingredients are used in the production of these treats. Living World Quinoa Bites are a great source of Protein, Zinc and other essential nutrients, helping to promote a soft and shiny coat.